We are Basil. We love to see you enjoying your bike. That’s why we make beautiful and functional cycling accessories that will encourage you to ride your bike more often. Because cycling is good for you and helps provide your daily dose of happiness and exercise. It all started 40 years ago, when Ine van Dam walked into Nico van Balveren’s bike shop. She was looking for a wicker basket for her bicycle. Nico developed the basket and made Ine very happy with it. And, most importantly, the basket allowed her to enjoy her bike rides even more. Not much has changed since then in our family company. Our passion is coming up with products that make cycling more attractive and more fun. Always based on your wishes. We want to understand why and when you cycle. As well as why and when you don’t. We learn from this every day. And we combine it with our sense for quality, style and functionality. Together, we can spread the cycling joy. Will you join us? Numerous cyclists make full use of Basil's bike accessories. 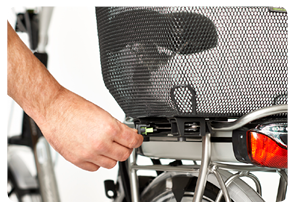 Choose your bike bag, bike basket, bike crate, dog bike basket, fastening system or other bike accessory. 1934 In 1934 Marinus Johannes van Balveren started the M.H. 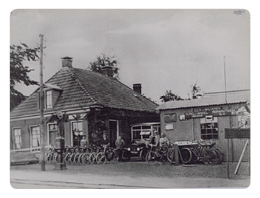 van Balveren bicycle shop in Silvolde (Ulftseweg). 1962 In 1962 Marinus Johannes van Balveren’s bicycle shop was taken over by Nico van Balveren. 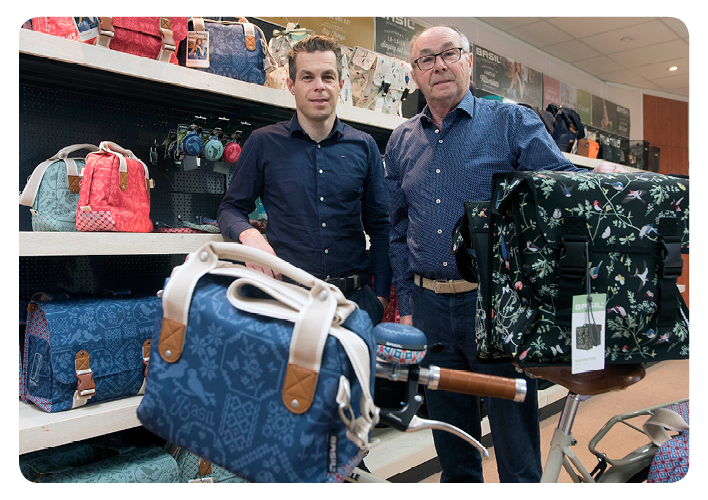 1976 It all started when, in 1976, Ine van Dam walked into Nico van Balveren’s bicycle shop and asked for a wicker basket. Nico had the basket made for Ine and made sure that Ine could enjoy her bike even more with this basket. Under the name ‘N. van Balveren Riet Import-Export', later to be changed into Basil (made up of van Balveren and Silvolde), Nico started importing baskets from the former Yugoslavia. 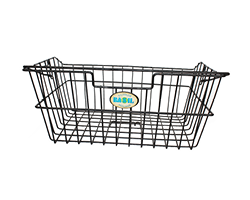 1980 Starting in 1980 Basil imported steel baskets as well. 1992 In 1992 the new warehouse at the Ettenseweg in Ulft was opened. The head office moved from Silvolde to Ulft in 1998. 2001 In 2001 Marthijn van Balveren took over the reins from his father Nico. 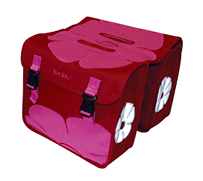 2005 In 2005 Basil presented the first ‘colourful bicycle bag’: Jasmin. Many successful designs followed in subsequent years. 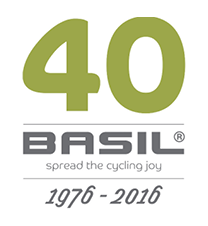 2006 Basil receives the FietsRAI Innovatie Award for the BasSolid system, which enables bicycle baskets to be attached to any type of carrier. 2009 In 2009 Halfords designated Basil ‘Supplier of the Year’. 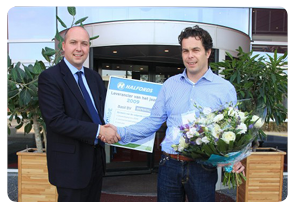 In the picture: Wim Braafhart (left) congratulates Marthijn van Balveren on the new title. 2010 Jorrit Schoonhoven, one of the ambassadors of the Dutch Design Week, selected Basil for Het Trend Book. Thanks to its multi-functional and modern design Basil is one of the 150 companies and individuals included in this prestigious book. 2015 The suppliers of Kruitbosch are evaluated based on several different criteria, to wit: innovative product range, proactive and inspiring, presentation of the overall stand, consumer orientation and playful/successful exhibition activity. 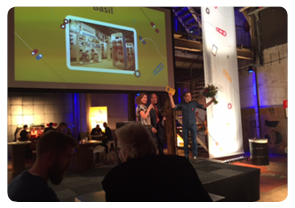 Basil was the ultimate winner and received the 2015 Supplier’s Award.